MTABC serves its members by continuing to expand its public relations materials and resources for use by the association and individuals. Please take advantage of the opportunities to use the following resources and contact MTABC if you have suggestions as to what other materials would be useful to you. The role of the External Relations team is to promote the public face of MTABC and encourage partnerships with other health communities, health organizations, media outlets, funding organizations and the general public by participating in community events and tradeshows, updating social media platforms, interacting with and supporting members in local media, and updating all MTABC public relations materials. As a free member service, you may order resource materials such as posters, postcards and brochures to have at your work site for Music Therapy Awareness Month or public relations events. 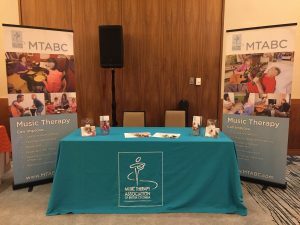 Post the MTABC poster on your office door, hand out brochures and postcards to guests, volunteers, family members, other professionals and administrators. MTABC website has a wealth of information for members. MTABC has 4 retractable banners that feature photos and information about music therapists working with seniors and with children. They can be used by MTABC members at workplace events, conferences, or trade shows. 2 banners are for use by MTABC members who live on Vancouver Island and two are for members who live in the Lower Mainland. Please contact the Director of External Relations at externalrelations@mtabc.com to reserve the banners. 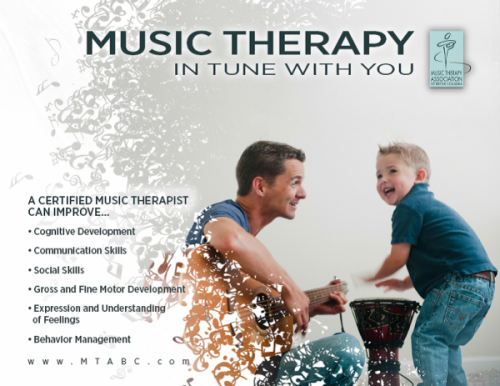 A magazine that features articles by certified music therapists who work with children/youth and seniors. There are also proceedings of the 2012 CAMT conference available here. 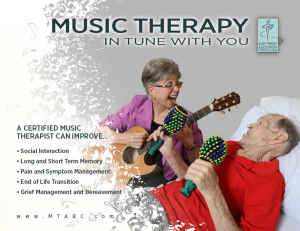 MTABC has created brochures (for seniors and children. Click here for example. ), posters and postcards to hand out or post at workplace events, conferences, or workshops. Please click here to complete the order form to obtain resources such as the brochures, postcards and posters. For further information, please email info@mtabc.com. 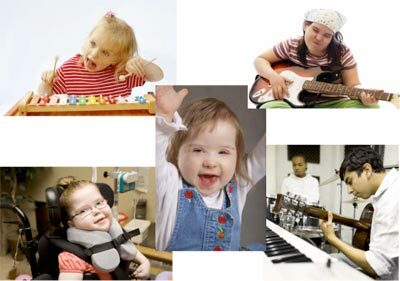 Thank you to Canadian Music Therapy Trust Fund for the support to purchase these materials.